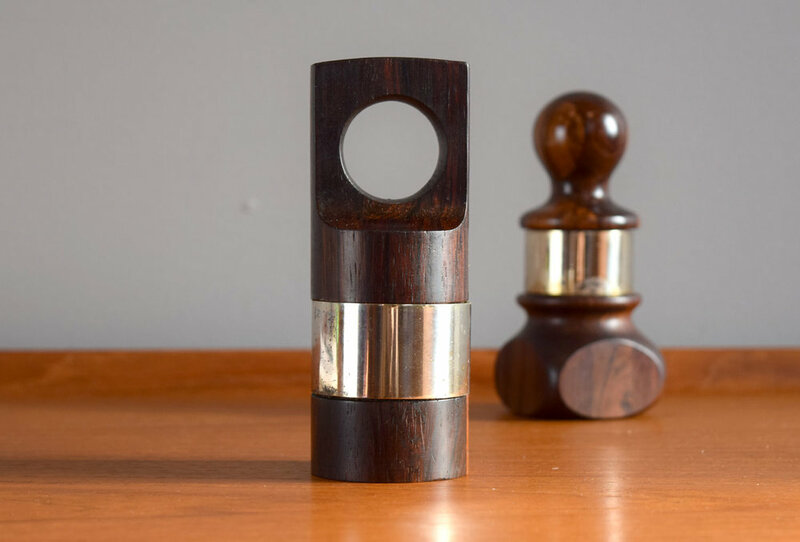 We are pleased to offer an extremely rare and highly sought-after rosewood / palisander and silver plated pepper miil - one of the earliest designs of the 'Rare Woods’ Limited Edition designed by the Jens Harald Quistgaard for Dansk Designs, Denmark in the 1960's. Only 7 pepper mills of the rarest shapes from this group were made with silver plated collars. We currently have two of these beauties! The ‘Rare Woods’ collection uses gorgeous and carefully chosen rare and exotic woods from Nicaragua, Brazil, British Honduras and East Africa. The natural wood surface has a beautiful finish and is smooth and heavy as marble. These pieces also feature top quality grinding mechanisms made of case-hardened steel by Peugeot Freres Lion, France. 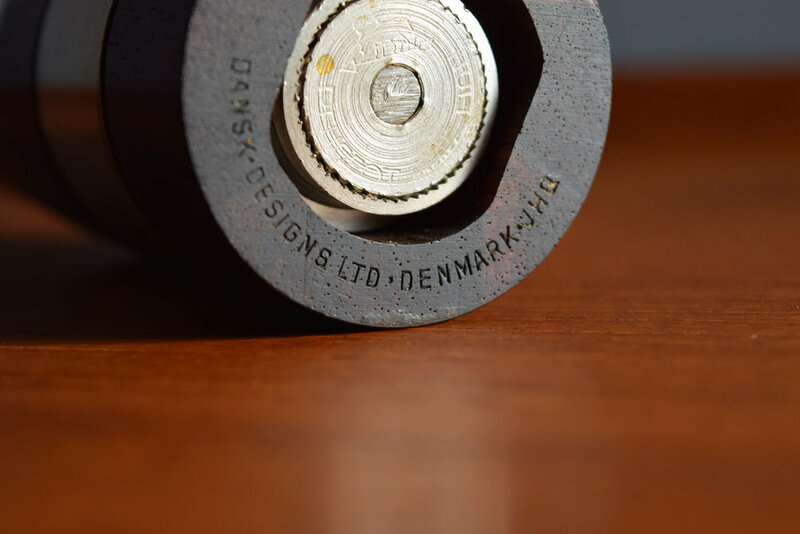 These signed grinders have been considered the best on the market since 1840. The durability of these mechanisms and their proven track record allows Peugeot to provide a lifetime guarantee on the grinding mechanism. 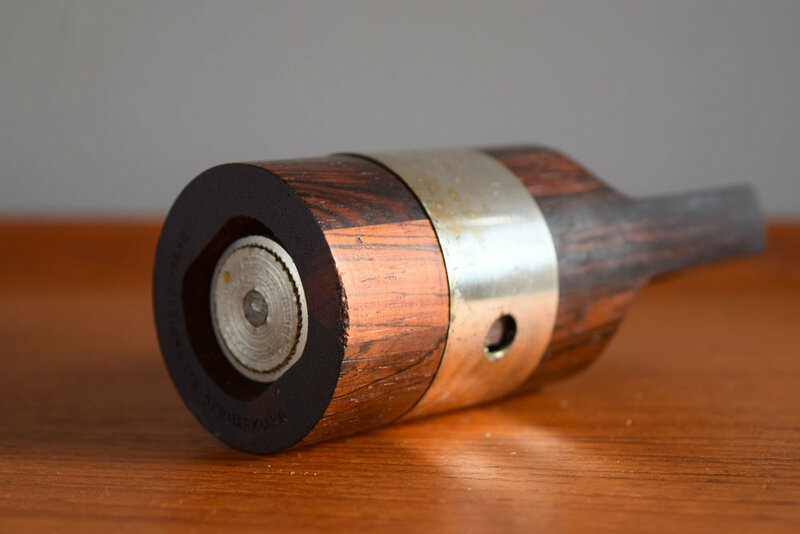 The peppermill still retains its lustrous patina. The silver plated band has some discoloration. There is a slight chip to the bottom edge as shown. We have not attempted to clean it. 5 1/8” high x 2” diameter.